This is the first of the diary pieces I’m filling Unseen with until the New York Film Festival comes. The point of the pieces is to give you a view into the random nature of my film watching. Over the next three weeks I'm going to show you what I watched each day in a similar period in August. I'm going to list every film, good bad or indifferent, discuss them and why and how I watched them. A good number of these films would never have ever gotten a mention at Unseen, while others would have. Strangely this experiment was also one of the quietest times in my film watching all year. With my old laptop dead and new one still in the box I’m forced to return to my DVD library for something to watch. I still have one Fantasia film left to watch (ASSASSINATION CLASSROOM) and a couple of upcoming releases (don’t ask I don’t know) but they are via screening links and I can’t access them. I decided to pull one of the big Alpha video cases off the floor and pick something at random. 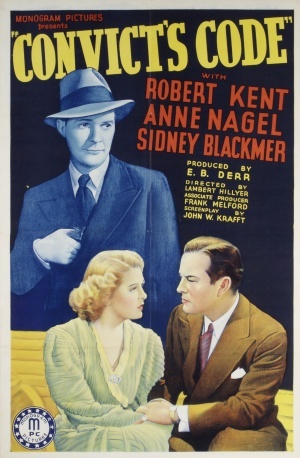 The film before bed is CONVICTS CODE a 1930’s B film. The plot of the film has an ex-football star getting out of prison. He had been framed for a bank robbery and sent away for 10 years. Getting paroled early for good behavior. Once out he gets work working for the big wig, who secretly had set him up. Doing various jobs for his boss our hero ends up falling in love with the boss’s sister. All the while he is also trying to run down the witnesses who sent him to prison. A solid little film this is a perfect little time passer. Not overly taxing the film moves around the familiar pieces with a deft hand as if the work of a master magician. If the film has few surprises it saves one for the end when as the film races to the climax it looks like the film is going to end in a decidedly down beat manner-the films the law must be obeyed being followed to the end-but there is a a twist which in a weird way actually makes sense. I enjoyed the films 66 minutes. Will I watch it again? Probably not but it’s a film I can heartily recommend to anyone who runs across it.